U.S. Vice-President Mike Pence kicked off his visit to Israel on Monday with a speech to the Knesset, and said the U.S. Embassy that's now in Tel Aviv will be moved to Jerusalem by the end of next year. U.S. Vice-President Mike Pence told Israel's parliament on Monday that the U.S. embassy will move to Jerusalem by the end of 2019. He received a rousing ovation as he pledged to barrel ahead with a plan that has set off weeks of unrest and thrown U.S. peace efforts into disarray. 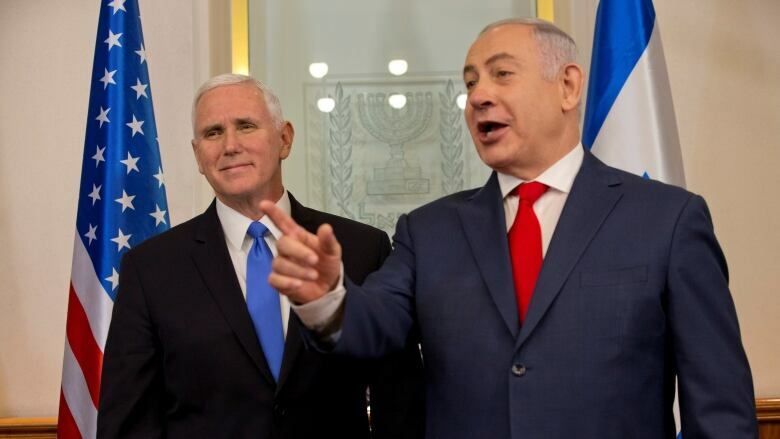 The plan to accelerate the move of the embassy, announced in the first address of a sitting U.S. vice-president to the Knesset, marked the highlight of Pence's three-day visit to Israel celebrating President Donald Trump's decision last month to recognize Jerusalem as Israel's capital. "Jerusalem is Israel's capital and as such President Trump has directed the State Department to immediately begin preparations to move the United States embassy from Tel Aviv to Jerusalem," Pence said. "Our message to President [Mahmoud] Abbas and the Palestinian Authority is the door's open. The door's open. President Trump is absolutely committed to doing everything the United States can to achieve a peace agreement that brings an end to decades of conflict." The most likely location is in Jerusalem's Arnona neighbourhood in a modern building that currently handles U.S. consular affairs like issuing passports, birth certificates and travel visas, said a U.S. official, who wasn't authorized to discuss it publicly and spoke on condition of anonymity. The U.S. consul-general works out of another Jerusalem facility that handles political affairs and diplomatic functions. In an interview Wednesday with Reuters, Trump took issue with a statement earlier that day by Israeli Prime Minister Benjamin Netanyahu that the US embassy would relocate within a year. Trump responded, "By the end of the year? We're talking about different scenarios - I mean obviously that would be on a temporary basis. We're not really looking at that. That's no." Pence was preceded on the Knesset dais by Netanyahu, who lavished his guest with praise and gratitude. It was part of an exceptionally warm welcome for Pence in Israel, which has been overjoyed by Trump's pivot on Jerusalem. But the move has infuriated the Palestinians and upset America's Arab allies as well. 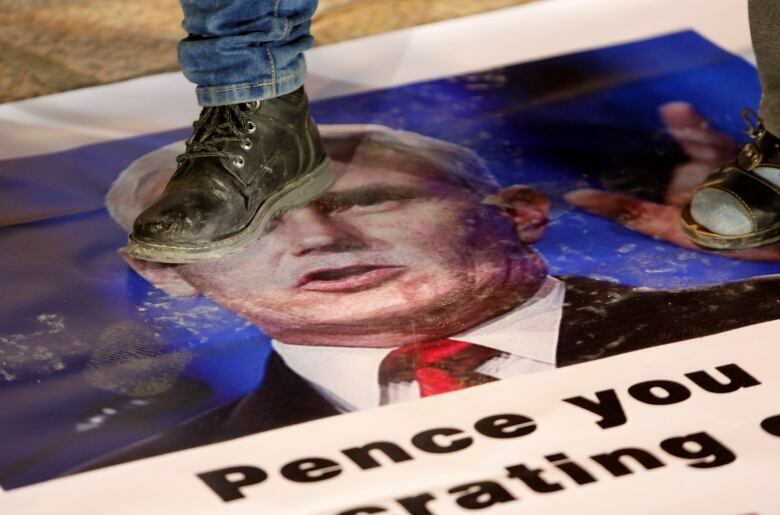 The main Arab party in the Israeli parliament had warned that it would boycott Pence. Its leader, Ayman Odeh, vowed they would not provide a "silent backdrop" to a man he called a "dangerous racist." At a news conference, Netanyahu praised Pence's speech to the Knesset as a "powerful expression of the enduring bond between our two countries," and notes their shared work to prevent Iran from destabilizing the region. Netanyahu said the two leaders met and discussed "common challenges and common opportunities" in the Middle East, including Iran. He says the Trump administration is "on the right side of history" by opposing the Iran nuclear deal. Netanyahu is urging world leaders to seize the opportunity created by Trump to "correct the failings" of the deal. Pence says both countries recognize the "rise of the common threat in Iran" and look forward to a broader reconciliation across the Middle East. 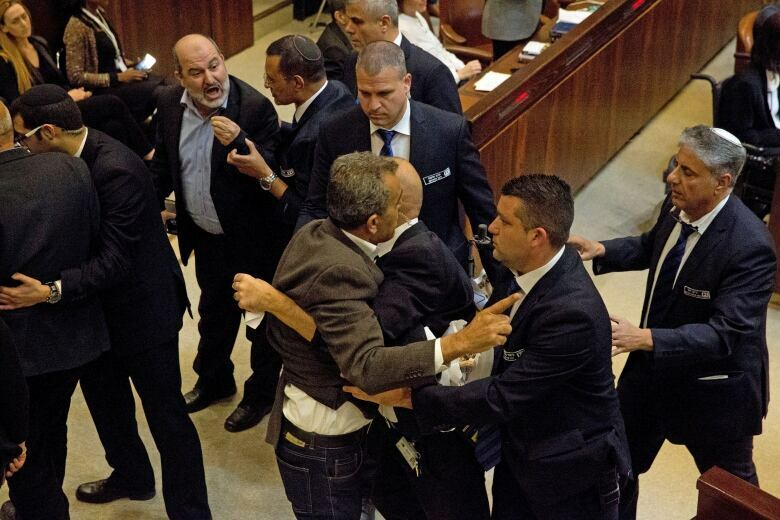 Sharren Haskel, a Canadian-born Israeli legislator and member of the ruling Likud party, was present for the speech. She told CBC's Derek Stoffel that she wants Canada to follow suit and move its embassy from Tel Aviv to Jersualem. "I think that Israel and Canada have shared a strong bond, a great friendship throughout history, and I think it is a just step, and the right step, and I would love to see Canada move its embassy as well," she said. Canada considered such a move in 1979, based on a campaign pledge by Joe Clark, then Progressive Conservative leader, who shelved the idea after he became prime minister. Clark said it would be "inappropriate" for Canada to do anything that might be interpreted as favouring one side or another while peace negotiations were ongoing.